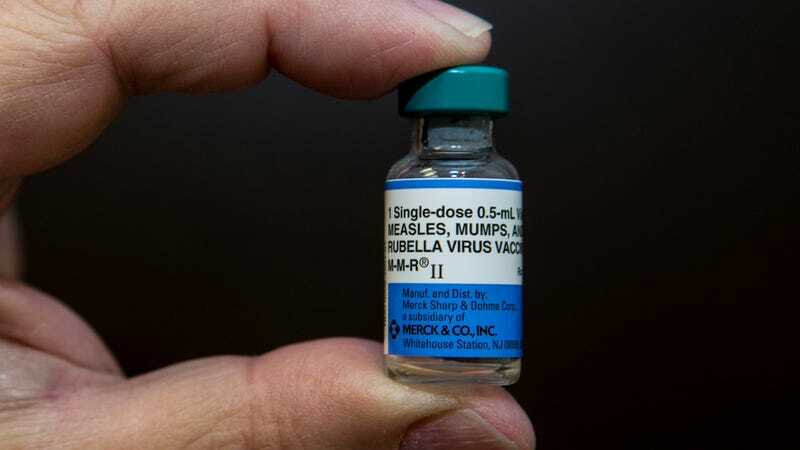 The life-saving measles, mump, rubella (MMR) vaccine. Decades of research has shown that vaccines do not cause autism spectrum disorder (ASD). But the fear of that connection continues to linger. And a new study published today in JAMA Pediatrics suggests that it’s scaring families affected by autism into not getting their children vaccinated. Scientists from the research arm of Kaiser Permanente, America’s single-largest HMO, as well as from the Centers for Disease Control and Prevention, looked at the vaccination records of more than 3,700 children who were diagnosed with autism by the age of five, from 1995 to 2010. They compared the children to a control population of 500,000 children born during the same time. And they also looked at the younger siblings of children from both groups, who were born between 1997 to 2014. The records were obtained from a database established by the CDC to monitor vaccine safety. “There were large disparities in vaccination rates between children with and without autism spectrum disorders, as well as between their siblings, across all age groups and after adjusting for important confounding factors,” said senior author Nicola Klein, director of the Kaiser Permanente Vaccine Study Center, in a statement. Specifically, only 82 percent of children with autism spectrum disorder over the age of seven got their recommended shots from the ages of four to six, compared to 96 percent of the control group. And 84 percent got their measles, mumps, rubella (MMR) vaccine, compared to 96 percent of children without autism. Only 76 percent of younger siblings to children with autism got their recommended first-year shots, meanwhile, compared to 84 percent of younger siblings to children without autism. The study is the latest to suggest that parents become wary of vaccines after their child receives an autism diagnosis. Research published last September also found that the younger siblings of children with autism were less likely to be vaccinated, and that parents were more likely to report side effects with their younger children who did get vaccinated. Unlike the current study, though, it found vaccination rates weren’t different among children diagnosed with autism themselves. The current study can’t tell us exactly why parents are avoiding vaccines following their children’s diagnosis, though the debunked specter of the autism-vaccine link almost certainly plays a role, the researchers say. Neither can the study tell us how to convince parents otherwise. “We need to better understand how to improve vaccination levels in children with autism spectrum disorder and their siblings, so they can be fully protected against vaccine-preventable diseases,” said co-author Frank DeStefano, a researcher at the CDC’s Immunization Safety Office. It’s estimated that one in every 68 children born today will develop autism in their lifetime.